... map and the performances, while enabling the elaboration of data with the polars of the boat project or other files containing recorded performances. This software can run only on Microsoft Windows. 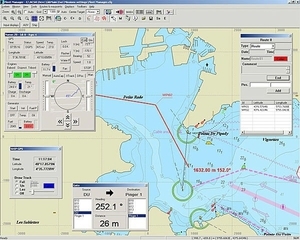 Boat software includes computer programs for navigation, on-board management or even the design of leisure craft. On NauticExpo these products are intended for recreational boating rather than merchant marine use. The immense number of programs includes those for the automated systems of luxury yachts, propeller design and navigational software. In fact, there are tools for every aspect of recreational boating. Most software is compatible with today's operating systems: Mac Ios, Windows or Linux. However, there is an increasing number of applications for smartphones and tablets. Cellphones now can be used to manage on-board lighting, music, engines, fuel and alarms, as well as navigation and other tasks. The software must be compatible with the computer or smartphone. Updates should be automatic or simple to carry out. Programs for trackers, navigation, engine management and similar taks require sensors (GPS, video, etc.). The availability and compatibility of electronic charts should be verified.